Discover more about each type of dance we offer! We offer a multitude of different classes ~ so you can experience all forms of dance! Check out each description to learn a little bit more, and download the Class Descriptions & Policies to save a copy for yourself. 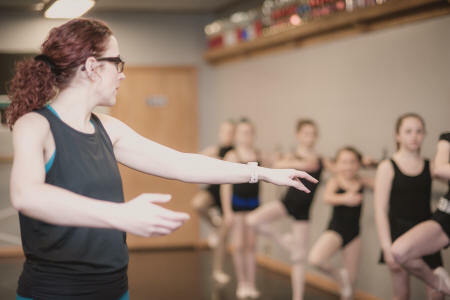 Ballet/Tap classes combine music, movement with the art of dance. Dancers will utilize 30 minutes of class in ballet shoes and 30 minutes in tap shoes. Lyrical/Jazz classes offer a combination of classical ballet, plus adding either and emotional element (lyrical) or an upbeat style of movement (jazz). The entry level of this style is for dancers who have little experience to no dance experience. The second level studies deeper into both styles. Hip hop dance refers to dance styles primarily danced to hip hop music or that have evolved as part of hip hop culture that includes a wide range of styles notably breaking, locking, and popping. The style of lyrical is a combination of ballet, jazz, and/or modern styles of dance. Lyrical dance is expressive, simultaneously subtle and dynamic, focused on conveying musicality and emotion through movement. Modern is a term used to describe contemporary dance. Modern dance centers on a dancer's own interpretations instead of structured steps, as in traditional ballet dancing. A modern dancer rejects the classical ballet stance of an upright, erect body, often opting instead for deliberate falls to the floor. Pre-Pointe is offered to ballet students at least nine (9) years of age who are not yet en pointe to further develop and strengthen the muscles necessary to go en pointe. Pre-pointe classes stress correct alignment and correct classical ballet technique. Pre-pointe classes also allow the instructor to assess readiness, offering an atmosphere for proper evaluation of important skills. Ballet slippers and proper attire are required for this class. This class focuses on the history of Broadway and dance's role in it. Musical productions new and old will be discussed, as well as acting techniques to improve the dancers' performance abilities. The Mommy & Me class is designed as movement exploration for our youngest dancers! The use of props, mats, and sing-along songs allows each parent to help their child develop motor and coordination skills in a fun, structured environment. This class is a perfect opportunity for young dancers to enjoy the dance fun before they are old enough to join class on their own for more dance instruction. Dancers are required to wear ballet slippers or bare feet; adults are required to come in socks or barefoot. Guardians and caregivers are also welcome to attend! Contemporary dance is a style of expressive dance that combines elements of several genres including modern, jazz, lyrical and classical ballet. This genre of dance strives to connect the mind and the body through fluid dance movements. Contemporary relies heavily on versatility and improvisation, very different from the core genres of dance. This style also focuses on floorwork, using gravity to pull them down to the floor. This style can be executed bare foot; and performed to a variety of styles of music. Our Heels Class is a high energy dance class that is done, you guess it, in heels! This class will teach jazz technique in heels, musical theatre, hip hop and waacking! Waacking is a form of dance created in the clubs of Los Angeles; origination from the 1970s disco era in Los Angeles, this dance is also composed by hip hop. Waackingconsists of moving the arms to the music beat, typically in a movement of the arms over and behind the shoulder. Waacking also contains other elements such as posing and footwork. Waacking puts a strong emphasis on musicality and interpretation of the music and its rhythm. Dancers must be 12 years of age to participate. Character or ballroom heels should be worn. No street heels.